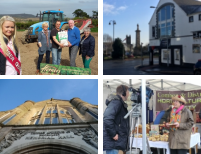 Comber Regeneration Community Partnership (CRCP) is a group of local people with the main aim of making Comber one of the most attractive places to live, work and play in the Borough by helping to regenerate the town physically, economically and socially. 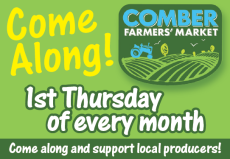 We welcome you to Comber, our small market Town renowned for its potatoes, the Comber Earlies and in the past its linen, whisky and the famous Tourist Trophy (TT) motor races. Its vibrant history reflects a close connection to the Titanic through the Andrews family. Comber’s fine Georgian Square is one of the most attractive of any Town in Ulster. Set in miles of rolling countryside the Town is the gateway to the west side of Strangford Lough and many local environmental and heritage attractions. Visitors to Comber can expect to enjoy excellent local cafes and restaurants and a number of smaller antique, artisan and other speciality shops and services.